The originator is back. The initial print run of 75 glorious hand-stitched copies of my fiction chapbook When the Cats Razzed the Chickens may have sold out many moons ago, but it's back and it's happy and it's green. It's also easier on the wallet. And it's got some great company. Because Razzed isn't the only Folded Word chapbook to go green, oh no no no. 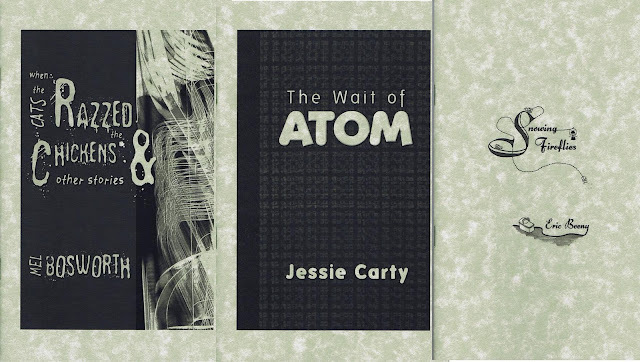 Jessie Carty's The Wait of Atom has also gone green. As well as Eric Beeny's Snowing Fireflies. Grease is still the word, but Green is definitely the color.